Our fresh dry roasted salted pecans ground into pecan butter - nothing else added. 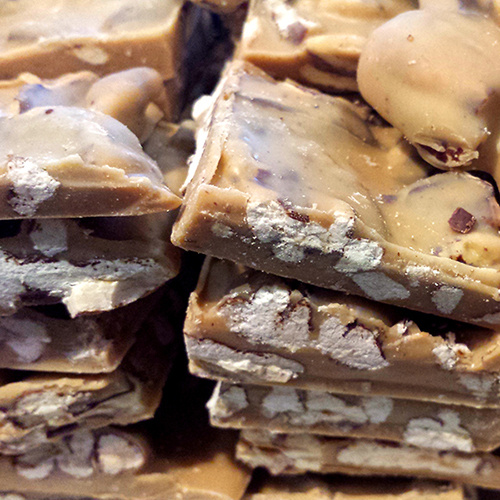 Our fresh dry roasted salted pecans ground into pecan butter - nothing else added. The freshness is incomparable; the nuts are roasted within 1-2 days of grinding them into nut butter, and are ground into butter shortly before shipping. The crunchy texture with little bits of pecan only intensifies the experience. Think...desert on a spoon. 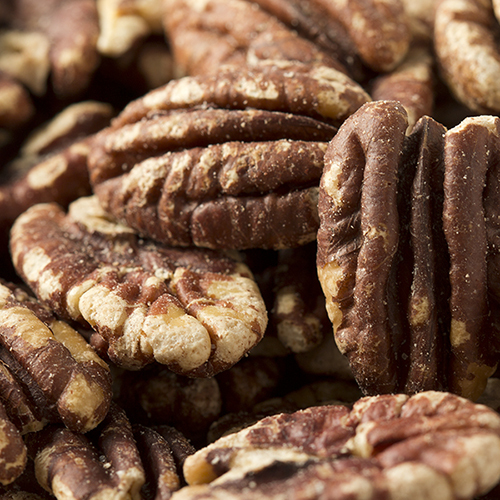 Although high calories and fat, pecans are still good for you – especially men. Pecans contain beta-sitisterol which aids in the relief of an enlarged prostate. This item is sold per lb and will arrive packed in two 8oz containers to avoid leakage of the natural oils. 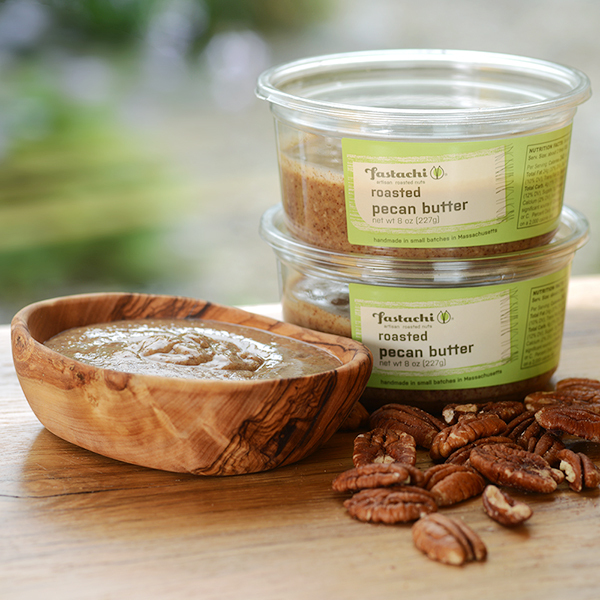 Pecans are high in natural oils, and the natural oils separate much more quickly in comparison to our other nut butters. NUTRITION FACTS: Serv. Size: About 2 tbsp (32g). Servings: About 14. Amount Per Serving: Calories 240, Fat Cal. 210, Total Fat 24g (37% DV), Sat. Fat 2g (10% DV), Trans Fat 0g, Sodium 125mg (5% DV), Total Carb. 4g (1% DV), Fiber 3g (12% DV), Sugars 1g, Protein 3g (6% DV), Calcium (2% DV), Iron (4% DV). Not a significant source of Cholest., Vitamin A or Vitamin C. Percent Daily Values (DV) are based on a 2,000 calorie diet. INGREDIENTS: ROASTED & SALTED PECANS (PECANS, SEA SALT). I have ordered this pecan nut butter several times and it is wonderfully tasty. I use it on cereal, pancakes and in smoothies. I highly recommend buying this nut butter. I have been ordering Fastachi nut butters for family and friends for years. Recently, a shipment arrived of these nut butters. Each butter is to be savored slowly and sweetly. 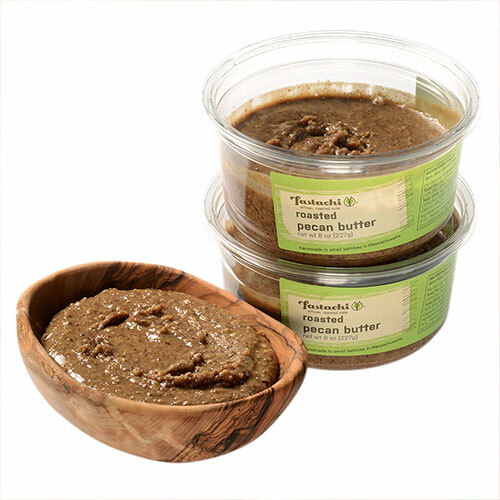 The freshness and deliciousness of the Fastachi nut butters is beyond description. Currently, am enjoying the subtle-flavored pecan butter. Doesn't get any better than butter by Fastachi! This pecan nut butter is delicious. Love it! Most delicious pecan butter ever! I love this roasted pecan butter! Best of all the butters! It is heavenly, so yummy! Your pecan butter is so tasty & smooth. It's obviously fresh and is a great way to get extra protein in my breakfast. Especially like it on sprouted grain English Muffins. Very, very delicious. Great spread on pieces of Granny Smith apples. A friend gave my first taste of Fastachi pecan butter & I was sold! Very delicious & fresh. Just have to stir it up when it first arrives due to oil separation. Mar 22, 2016 | By Katherina C.
This pecan butter is delicious and quite addictive - tastes great on toast, muffins - everything! Pecan butter on a whole grain English muffin with a touch of honey is my favorite breakfast! This is the best nut butter I've tasted, with hazelnut butter being my second favorite. Fataschi's nut butters taste so fresh & are a treat to the palate. I have tried all the nut butters and I can't decide which is my favorite!!! I have tried many different brands, Fastachi is far and above the best I have had. They are packaged well, easy to spread and absolutely delicious. The only problem is deciding which one to have!!!! My sons and I all enjoy Fastachi pecan butter on a daily basis. It is especially delicious whan spread on toasted whole grain bread. Fastachi's roasted pecan butter is better than pecan pie! The roasted pecan butter is so rich and decadent, you'll think you're eating pie. Just be careful not to eat the whole container in one sitting...it is much better to savor it! The Pecan Butter is almost too good. Its become my daily fix. When I don't want it to be as rich I mix in some walnut butter. The Pecan butter is decadent. Hardly a day goes by that I don't eat Fastachi pecan butter on a slab of toasted whole grain bread. This is a combination I always look forward to having at lunch, along with whatever else. The pecan butter is not just the best pecan butter I have ever tasted, it is simply the best nut butter out there. Go ahead try to find a fresher and more addictive tasting nut butter. I bet you can't! May 9, 2014 | By Melissa T.
These are outstanding! I have to control myself so I don't eat too much. Thanks for such an incredible product. I will be buying more. Owner Response: Thank you for your recent product review of the pecan butter. The fluidity of the pecan butter stems from the characteristic of the pecan itself. Pecans are high in natural oils. We dry roast our premium grade pecans in sea salt, and we grind them into nut butter with no added oils, sweeteners stabilizers or preservatives. This is the reason that the pecan butter separates much more quickly than other nut butters, and is so fluid. I have eaten a lot of nut butters, and a couple of pecan butters, but this one is the best of them all. Of the Fastachi nut butters it is among the oiliest and the only with with salt, but even my father, a health-freak athlete of the anti-fat Pritikin generation, loves it. Wonderfully rich taste. I am totally addicted to the pecan nut butter. I eat it by the teaspoon, on a jelly sandwich, or with bananas. This is the most delicious pecan nut butter I have ever eaten. Am ordering more of this wonderful butter! It is good for you too! Love the pecan butter. I love making pecan butter and jelly sandwiches, which are totally delicious with the pecans. I am totally hooked on this butter. Love it!!!!! Delicious!! I like to put a couple of tablespoons in a little cup, warm it in the microwave, and eat it for dessert. Unbelievably tasty! Like pecan pie without sugar. I was introduced to Fastachi's nut butters at the Cape Ann Farmers' Market, and have been ordering them online since the farmers' market came to its seasonal end. Both the service and the product have been superb. The nut butters are very fresh and keep for a long time without a trace of rancidity. The pecan butter in particular makes a fantastic ice cream substitute when blended with some frozen bananas (good for vegan/paleo folks but also just really delicious for anyone!). Highly recommended. This is the best nut butter out there. I'll drive a long way to get it. Only wish you could get it in a bigger tub. Dip apples in it- tastes a little carmel-y. Very, very good. So delicious....worth every penny! I never buy store nut butters again. Exactly as described. Creamy, rich, perfect roasted pecan flavor !! I'll be back. Thanks! Excellent taste and texture! Will definitely be order again!